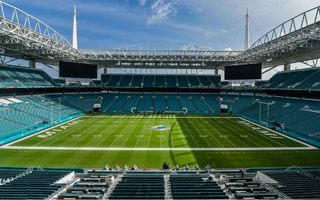 The reconstructed football stadium in Miami saw revenue increase of 11% last year, according to Fitch Ratings. The agency gave South Florida Stadium LLC credit rating of BBB (‘investment grade’). While financial boost is nothing new for upgraded stadia, it’s worth noting that it includes only the 2015 fiscal year, when the building wasn’t entirely delivered and didn’t operate optimally. Add to that the fact of not having a naming rights partner back then (the $250-million Hard Rock deal was approved this past August). Also, the stadium is yet to begin its series of large-scale non-football events, like concerts and soccer games, as well as hosting the 2020 Super Bowl. With all the above included, further growth in upcoming years is predicted. On a final note, it’s worth noting that the 11% increase came after capacity of the stadium actually fell by 2015 from 75,000+ to 65,000+. This means on average visitors left significantly more than in 2014, primarily due to expansion of corporate hospitality options throughout the stadium.